Egyptian Vultures in Oman الرخمة المصرية في عُمان: Detailed flight to foraging at a rubbish dump. This is a blog about Egyptian vultures (Neophron percnopterus) and other scavenging bird species in Oman. If you click on any images in the blog, it will be opened in a separate window, will be larger and it will be easier to see detail. Detailed flight to foraging at a rubbish dump. The transmitters we have used on some of the Egyptian vultures that we have been tracking since January 2018 can, when light conditions allow, collect location data every second. This means that very detailed tracks of the birds' movements can be mapped. When analysed closely along with information on weather, terrain and habitat, we can start to understand more about vulture flight. This can be important, for example, in understanding the likely risk of vultures colliding with wind turbines, and making decisions about turbine placement and size. Ivaylo has been taking an initial look at those data. 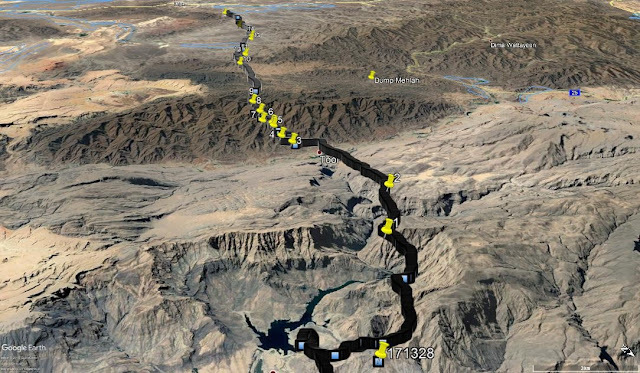 Below is a short story about a 53 km flight by an Egyptian vulture (171328) between its territory near Quriyat and the rubbish dump at Ibra. On 9.03.2018 at 6:59:35, 171328 took off on a long foraging flight to the rubbish dump near Ibra – 47 km straight-line distance to the southwest. This bird regularly forages at the dump; this was one of 90 such flights that were made in 2018, and one of the 9 this bird made in March. During 2018 this bird also made 49 flights to the main landfill of Muscat at Al Multaquaa, 47 km to the west. The 53 km track of an Egyptian vulture from its territory near Quriyat to the rubbish dump at Ibra. Yellow pins indicate thermal soaring (Viewed from the NE). 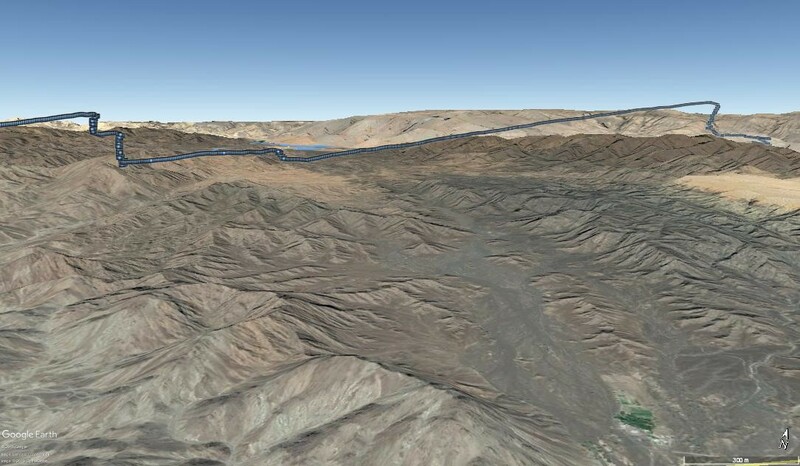 Thanks to the south-facing slopes, the initial third of the route (25 min) was transited in almost level gliding flight, with only two quite brief instances of thermal soaring. At 7:25 the bird flew over the village of Tool (270 m asl), and started ascending in order to cross the mountain ridge south of it (1070 m asl). To transverse the next 5.5 km and the rising terrain (from 426 to 1662 m asl), the vulture used, during a period of 19:39 minutes, seven consecutive uplifting thermals. During the time spent in gliding flight between the thermals, the vulture lost only 58 m in elevation. View of flight from the west, showing the use of seven thermals to gain altitude and cross the rising mountains (viewed from the east). Upon reaching the peak of the central ridge, the vulture flew into and utilised the highest thermal of the flight, which it used for 4:12 min to gain an additional 589 m in elevation, reaching 1662 m asl. While using the thermal the vulture also encountered a strong headwind, which pushed it back in the direction of Quriyat. 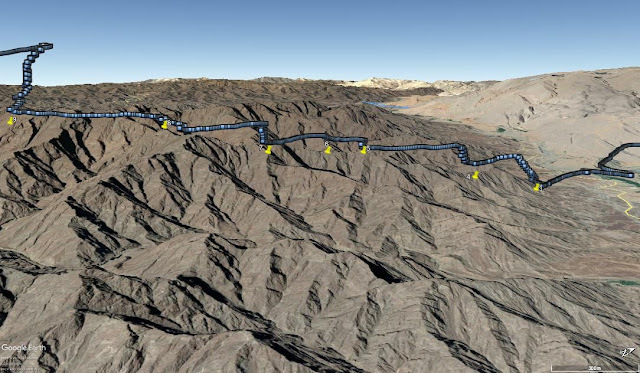 Use of a thermal at the ridge of the Eastern Hajar Mountains (viewed from the east). 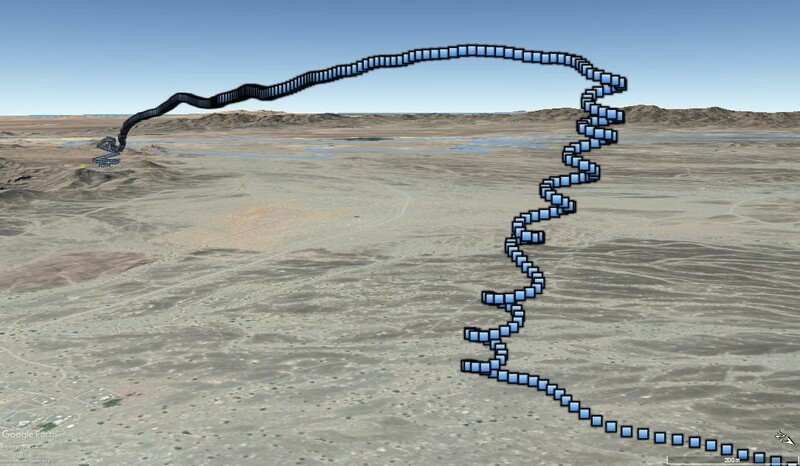 After covering another 11 km, the vulture entered two, spatially close, consecutive thermals, in which it spent 5:08 min and gained 507 m of altitude (Map below). The last (№15) thermal soaring occurred 6 km north of the Ibra dump site, over flat terrain above a wadi. 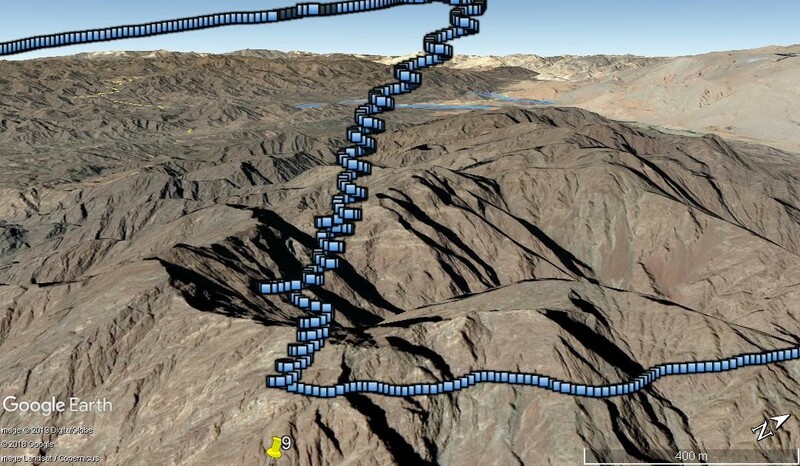 The vulture spent 2:08 min in that thermal, and gained 314 m of elevation. From the top of the thermal it descended to the dump site, arriving at 08:30. The final (15th) thermal flight by the Egyptian vulture before descending to the rubbish dump at Ibra (viewed from the east). Egyptian vulture work in Oman is a partnership between International Avian Research, the Bernd Meyburg Foundation for Raptor Research and Conservation, the Environment Society of Oman, the Greater Los Angeles Zoo Association, the Vulture Conservation Foundation, Shell Development Oman, and Shell Oman Marketing. Click on their logos or links above to go to their web sites. All field activities are conducted with the permission of the Ministry of the Environment and Climate Affairs in Oman. Copyright International Avian Research. Picture Window theme. Powered by Blogger.